Indoor air is frequently more than 10 times (and often more than 100 times) more polluted than outdoor air. Indoor air pollutants (dust, VOCs, bacteria, mold, etc.) contribute to respiratory issues, common cold, disease and general feelings of unwellness. If you are looking for great ways to improve indoor air quality, I just wrote a post about 10 Way to Improve Indoor Air Quality. The #10 suggestion was to get an air purification system. Having an air purification system has been life changing for me! 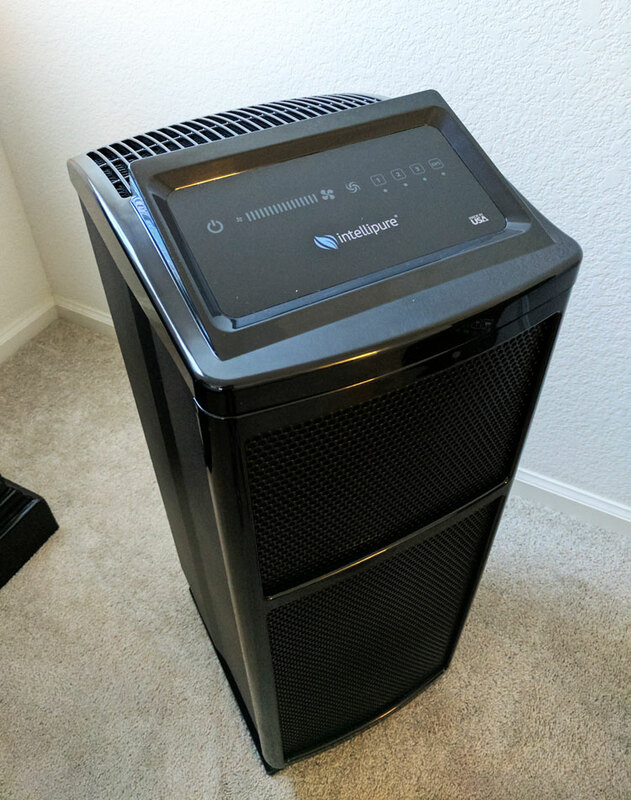 I have had the Intellipure Ultrafine 468 for five months and it has improved our indoor air quality and contributed to me breathing easier! Earlier this year when the Intellipure showed up on my doorstep, I couldn’t have been more excited. It took but only 3 minutes for me to grab it off the porch, carry it to our upstairs bedroom and get unwrapping! This is a video of me unboxing the Intellipure Air Purifier. You will see what comes with the unit (user’s manual, a warranty registration card, and Certification of Efficiency) and how the unit is securely packaged when it is shipped. The Air Purification System is ready to go right out of the box. 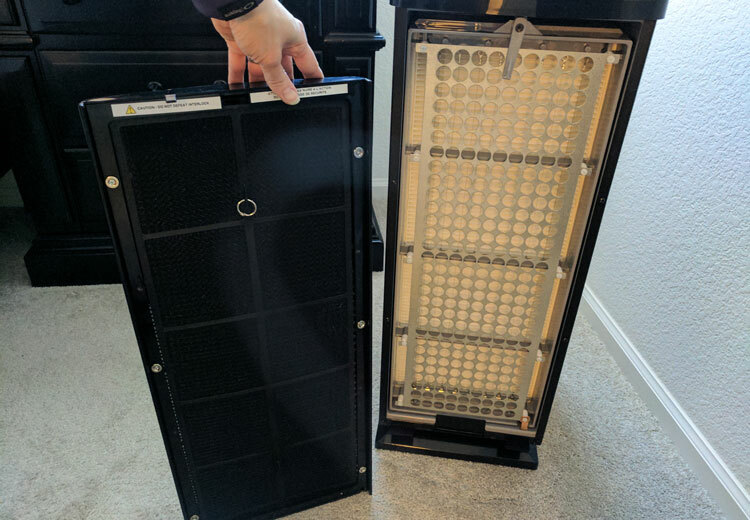 In fact, Intellipure product testers individually test every unit for particle efficiency before shipping – so there are no filters to install and nothing to set up! It’s ready to go as is – all you need to do is plug it in and turn it on! Did you know that air pollution is the world’s largest single environmental health risk? Sadly, more than 5.5 million people worldwide are dying prematurely every year as a result of air pollution, according to new research. More than half of the people in the U.S. live in counties that have unhealthful levels of air pollutions, putting them at risk for premature death and serious health effects including lung cancer, asthma attacks, cardiovascular disease, and developmental and reproductive harm. EPA recommends that people clean air with high-quality portable air purifier. Intellipure is the only air purifier on the market that combats all three pollutant categories: Micro-organisms, Volatile Organic Compounds (VOCs), and Particles. Can help with allergies (pet dander, dust and pollen), asthma, sleeping and more! Healthway (the maker of Intellipure brand purifiers) has more than 35 years experience in indoor air quality solutions. Uses only 1 watt per hour when on low or sleep mode. Intellipure is designed and manufactured in the USA. Intellipure Ultrafine retails for $999. I struggle with chronic illness. I have good days and I have bad days. However, when I catch the common cold – I stay sick double the amount of time someone “normal” and “healthy” would. A few things that I have noticed since using the air purifier have to do with my sleep and allergies. Better, more peaceful sleep is something I didn’t expect would happen with cleaner air – but sure enough! I now wake up more refreshed and feel great in the morning. Spring and Summer are the worst times for my allergies and so far this year I have not been sneezing or sniffling! I know it sounds extreme, but I can tell the air is fresher. It feels like it is less thick. It feels cleaner and has a crispness to it! As far as taking the best care of myself to stay healthy, I have added air purification to my regimen. I think it is so important to live a balanced life, stay active, eat organic and breath clean purified air. Air pollutants are floating around all over in our home – from pets, to cleaning products and even leaching from new fabrics and furnishings! There are a lot of ways you can help improve the air quality in your home, one of which is a air purifier. I feel like I got a true test of the Intellipure Purification System after using it for over five months. 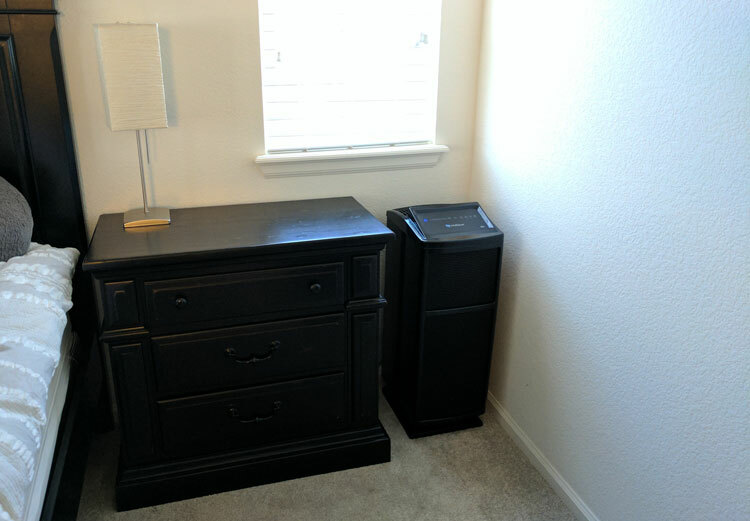 I love that this system is stand alone and it can easily be transferred from room to room. There is a handle on the back and it is surprisingly lightweight! Plus, it has wheels if you have hardwood floors – you can just roll it around! The system works with their patent filtration process called Disinfecting Filtration System (DFS). It goes beyond what a HEPA filtration system can filter. In fact, the DFS technology is more than 40x more efficient than HEPA filtration standards. While HEPA filters are more dense, louder and use more energy, the DFS filters produce cleaner air while using less energy and producing less noise. I can attest to the sound – it is so quiet! It is like having a white noise machine while I sleep. There are a lot of reasons I love the Intellipure Ultrafine 468. In summary, this air purifier stands out among others because (1) it is individually tested before it is shipped, making sure it passes a test that captures 99.99% of airborne particles, (2) it uses less energy than HEPA filters (3) it captures three pollutant categories: Micro-organisms, Volatile Organic Compounds (VOCs), and Particles and (4) it is assembled by hand in small town USA.